Devin Nunes sues Twitter and users, including @DevinNunesMom, for defamation. President Trump shakes hands with Rep. Devin Nunes as then-House Majority Leader Kevin McCarthy looks on Oct. 19, 2018. California Rep. Devin Nunes filed suit against Twitter Monday alleging the social media company was “shadow-banning conservatives” (surreptitiously minimizing the reach of their tweets) and enabling defamatory harassment on the platform. The super Trumpy ranking member on the House Intelligence Committee is seeking $250 million in compensatory damages and $350,000 in punitive damages. The suit also targets a handful of individual Twitter users, including @DevinNunesMom, “Devin Nunes’ Cow” or @DevinCow, and Republican consultant Liz Mair, who worked with the anti-Trump dark money group the Swamp Accountability Project, which also took aim at Nunes online. 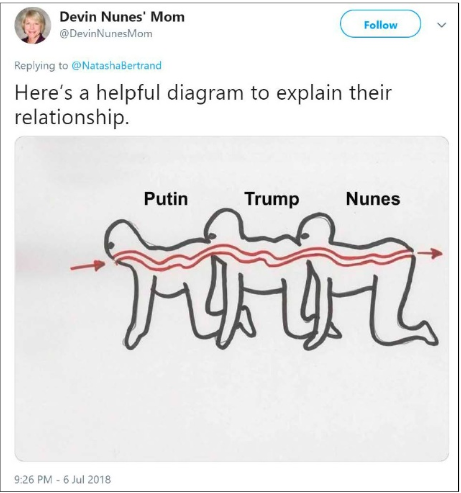 A @DevinNunesMom tweet included in Devin Nunes suit. “Defendant, Devin Nunes’ Mom, is a person who, with Twitter’s consent, hijacked Nunes’ name, falsely impersonated Nunes’ mother, and created and maintained an account on Twitter (@DevinNunesMom) for the sole purpose of attacking, defaming, disparaging and demeaning Nunes,” the suit states. “In her endless barrage of tweets, Devin Nunes’ Mom maliciously attacked every aspect of Nunes’ character, honesty, integrity, ethics and fitness to perform his duties as a United States Congressman.” The suit claims Nunes won reelection by a narrower margin as the result of the attacks by this random account that has now been suspended. The real irony here is that Devin Nunes has strayed pretty far from the truth himself both online and in real life in his defense of our current Defamer-in-Chief.